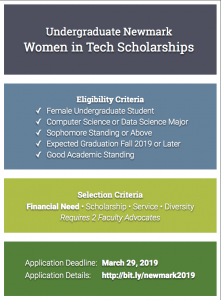 The Department of Computer Science is now taking applications for the Fall 2019 Undergraduate Newmark Women in Tech Scholarships! These scholarships will cover at least $5,000 in tuition for Fall 2019. Female undergraduate students in good academic standing majoring in Computer Science or Data Science with sophomore standing or above are eligible to apply. If awarded, how will receiving this scholarship contribute to your academic success at USF next year? Please keep your response under 300 words. Please describe your scholarship and service, including concrete evidence where possible. This can include a mix of your GPA, individual class grades, class projects, side projects, research projects, internships, community service and volunteer work, and more. Please keep your response under 500 words. 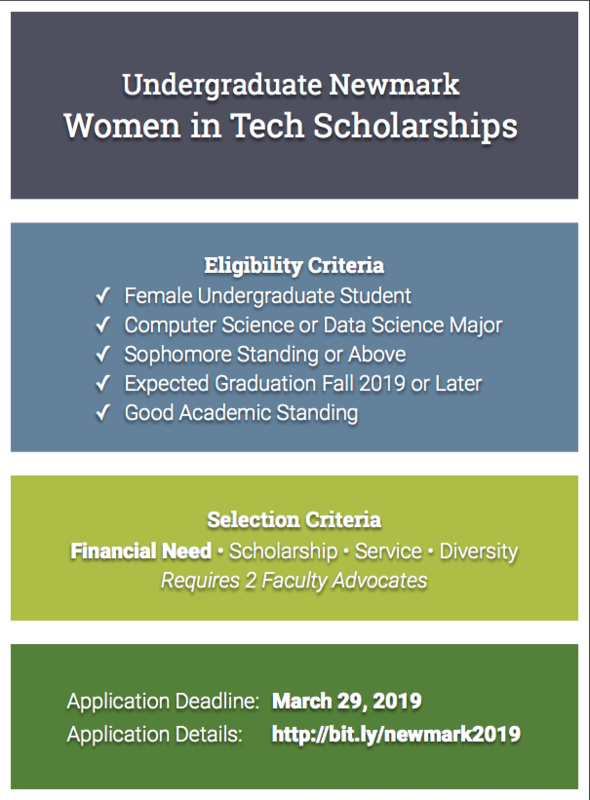 How would receiving the undergraduate Newmark Women in Tech scholarship contribute to your career goals after you graduate? Please keep your response under 300 words. You will also be asked for the contact information of two faculty advocates. Please be sure to reach out to these faculty members BEFORE submitting this application! For full consideration, applications must be submitted by March 29, 2019. See http://bit.ly/newmark2019 for details.